Hello! I just purchased my first home and am ready to start gardening and landscaping my lot. I ran across this photograph online and LOVE the mix of colors and texture. But I have no idea what any of these plants are! Can anyone help me identify what plants were used in this design? I'm specifically interested in the dark plum/black flowers. very pretty picture...I would love a bed that looks like that. I can identify the little grey plant in front...Lambs ears...lovely plant! 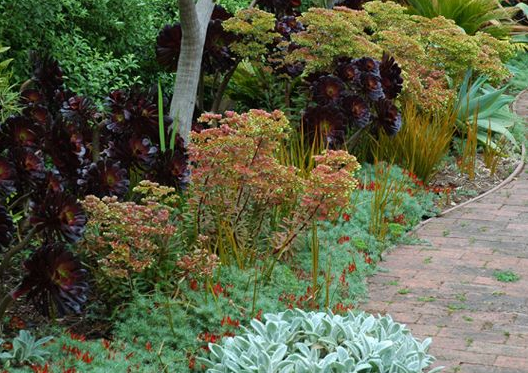 The beautiful dark plant is Aeonium arboreum 'Schwarzkopf'. Hardy in zone 8/9 if sheltered. I believe the ground cover in front is Lotus maculatus. The taller one looks like some sort of Euphorbia but I am guessing as it is not too clear in the picture. Knowing without doing is like plowing without sowing." Have you emailed the owner of the site where you found the photo? If the owner isn't the photographer, be sure to get the contact info for the photog. What does s/he say these plants are? And, almost more importantly: WHERE are they growing? If they're growing in "California" or any other state with several different bioregions, see if you can get a more specific description of WHERE they are: a town or perhaps a county. And, to learn whether you're doomed to total frustration or not re. these plants, where are you located (approximately)? There are certain plants that require hard winter cold/freeze for proper dormancy and cannot grow in the SF Bay Area because we're too warm (lilac trees come to mind), and there are plants which require tropical heat and cannot grow here because we're too cold rather than too warm (mangoes...). It could be that at least some of the plants in the photograph won't be suited to your climate. But you might be lucky! Maybe you live in their zone. Please let us know what you find out.